Paul Murphy, Media, Entertainment & Arts Alliance, chief executive. For a union-movement launch of Behrouz Boochani’s new book, No Friend but the Mountains: Writing from Manus Prison. Behrouz Boochani is a Kurdish-Iranian journalist who has been detained on Manus Island by the Australian Government for the past five years. He used a mobile phone to write this book and produce a film about his experiences in detention in the Manus prison, and has also written for many Australian media outlets. He has been adopted and recognized by PEN International as a journalist and writer imprisoned and persecuted by Australia. Michele O’Neil has been a fierce proponent for the rights of workers through the Textile, Clothing and Footwear Union, and for the rights of refugees seeking asylum in Australia. In 2018 she became president of the Australian Congress of Trade Unions (ACTU), Australia’s peak union body, which has a strong rights-based refugee policy that rejects offshore detention and turning back boats at sea. The Media, Entertainment & Arts Alliance (MEAA) has supported Behrouz’s efforts to be recognised as an accredited journalist and assisted him in receiving his International Federation of Journalists press card. 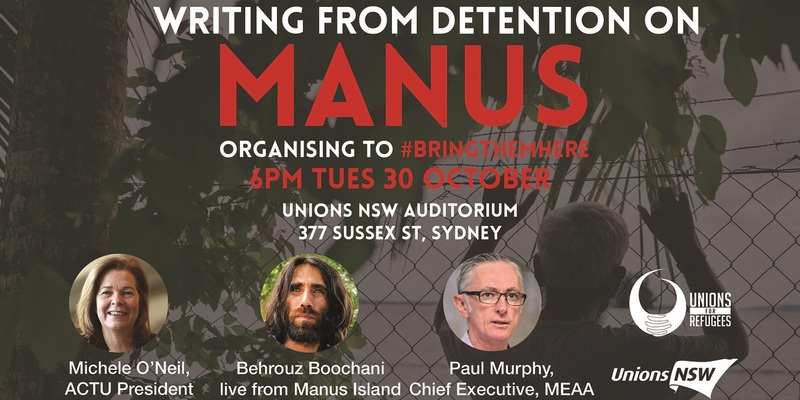 The media union has also campaigned for Behrouz to be released from detention and into the Australian community as part of its Bring Them Here campaign. This event is hosted by Unions for Refugees which was founded in 2013 by unionists in Sydney and is endorsed by Unions NSW.